This year the Church Fete organisers have joined forces with the Medbourne Sports Club to put on a tremendous day for all the family . 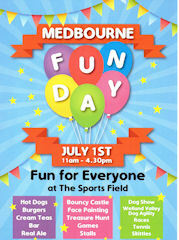 Sunday July 1st will see the Sports Field transformed into an area for fun and activities. The Welland Valley Dog Agility Group will put on a display which is sure to impress. There will also be a Dog Show for your pet to take part. If you feel like testing your skill and strength there will be Welly Wanging. There will be lots of games and races for all ages and a Bouncy Castle for the children. The Kettering Silver Band will provide music. You can try your hand at Tennis on the courts and have your face painted. There will be a plant stall and a home-made produce stall and also stands with a range of beautiful products. To assuage the hunger pangs there will be hot dogs and burgers and later on in the afternoon delicious cream teas. The Pimms bar will tantalise, beer will refresh you and ice cream will help you cool off. So make sure July 1st is in your diary! Come and celebrate Summer 2018 in a great setting. The fun starts at 11am. If you are able to contribute plants or produce, including cakes, please contact Meriel on 565802. Click on the poster to see it full size.